Ngoc Lan had recorded many duets with many different singers throughout her career, both male and female. Ngoc Lan's soft, gentle singing voice can be described as the epitome of femininity. Perhaps that is why her voice was so compatible for duets with male artists. Among the male artists Ngoc Lan had recorded duets with were Don Ho, Huy Sinh, Jo Marcel, Trung Hanh, Elvis Phuong, Nhat Truong, Vu Khanh, Chau Dinh An, Si Phu, Duc Huy, Trinh Nam Son, and of course, Duy Quang. There was a pleasant melange, like a perfect blend of the male and female voice, which came about when Ngoc Lan and Duy Quang paired up to record a duet. The chemistry between the two voices was undeniably magical. This was proven with the high sales these two artists experienced with their first duet album together, Bien Mong, released in 1987 by Kim Ngan, and again with Tinh Phai, released in 1989 by Dream Musical Productions. Both Ngoc Lan and Duy Quang were aware of how compatible their voices were for duets. That is why they recorded duet albums together a total of three times. Their last duet album recorded together was entitled Ta Say, released in 1994 by Ngoc Lan Musique. Nhu Mai and Kieu Nga had each recorded duets with Ngoc Lan. Similar to the popularity Ngoc Lan had experienced on duets with Duy Quang, her duets with Kieu Nga were widely received by Vietnamese audiences everywhere. The most popular duet song recorded by these two ladies would undoubtedly be Anh Thi Khong (Toi Jamais). The music video to that song alone was reason enough for the song's popularity with Vietnamese audiences. Here are my selections of the best duets Ngoc Lan had recorded with another artist. Of course, this song had to be included. Who doesn't like this version recorded by the top two Vietnamese queens of French music? This song was featured on Ngoc Lan and Kieu Nga's duet album released by May Productions, Paris Van Doi. Vietnamese lyrics for this song were written by Vu Xuan Hung. Featured on their first duet album together, Bien Mong, released by Kim Ngan (1987). This Duc Huy penned love song was done best as a duet by these two. I loved this song ever since I heard the original version recorded by Nhat Truong and Thanh Lan prior to 1975. But I must say, Ngoc Lan and Duy Quang added a certain distinct charm of their own with their version featured on their second duet album together, Tinh Phai, released by Dream Musical Productions (1989). This song was written by Tran Thien Thanh AKA Nhat Truong, of course. 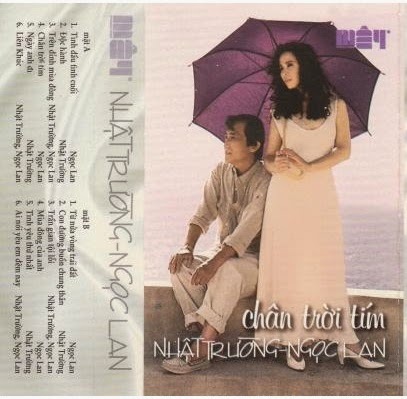 Featured on the Ngoc Lan and Nhat Truong duet album, Chan Troi Tim, released by May Productions, this has been one of my favorite songs writeen by Tran Thien Thanh ever since I can remember. I love how Ngoc Lan's voice blended so well with Nhat Truong's, similar to that of Thanh Lan and Nhat Truong's recorded duets together from way back in the day. Elvis Phuong had recorded many great albums in the 1980s. Among them was this unforgettable album, Lady Nguoi Toi Yeu, released in 1988, which comprised of a collection of French love songs he recorded with several female vocalists such as Kieu Nga, Minh Xuan and Ngoc Lan. Vietnamese lyrics to this song were written by Nhat Ngan. There you have it. That was my selection of the top 5 duet songs recorded by Ngoc Lan. What were some of your favorite duet songs Ngoc Lan had recorded? Anh Thì Không - duet with Kiều Nga. No need to discuss. Trên Đỉnh Mùa Đông - duet with Nhật Trường. Agree with you that next to Thanh Lan, Ngọc Lan seems to be the most fitting partner. No wonder why Nhật Trường had chosen Ngọc Lan to feature on his very first CD when he came to the US. How could I have forgotten about "Nho", Ngoc Lan's duet with Trinh Nam Son? I love their recorded version together of that song. You are right! Ngoc Lan's vocal interpretations on this duet was extremely heartfelt and moving, a truly artistic step that Ngoc Lan by that point in her career had finally reached. Many fans really like Ngoc Lan's earliest recordings while she was still in her 20s for the sweetness quality, comparable with honey, in her voice which undoubtedly had become a trademark for her and initially turned Ngoc Lan into a star. I do find those recordings of Ngoc Lan from her early days for Da Lan and Asia Productions enjoyable. But my respect for Ngoc Lan as an artist would grow much more gradually album-by-album, year-by-year while she was in her 30s. She began to sound more mature and sang with more feelings, in my opinion. Now, I can't really say much about how she sounded at live shows in the years after she became ill in 1992, since unfortunately I hadn't the opportunity to attend any of her live performances during those years. But from what I've seen from the footage of some live performances of Ngoc Lan that were captured on mostly camcorders now uploaded on youtube, it was obvious that the disease had taken its toll with her abilities as a live performer. Some might argue in her favor of how unfair it is to place such judgment, since the low audio qualities of many of these clips taped from personal home camcorders had not been factored in. Well, not to smear Ngoc Lan's credibility as a singer during those years, but even on a clip that had been captured with professional, state of the art equipment by the camera crew for Vietnam Performing Arts Television on KSCI- TV Channel 18, that we've all seen of Ngoc Lan at her major return live show held at the Anaheim Marriott Hotel in 1994 where she sang live one of her signature songs, "Ngay Vui Nam Ay" (Magic Boulevard), well I must say, after seeing that clip aired on television, I shared the same sentiment with most other viewers. It deeply saddened me. That was when it became obvious that something was wrong with our beloved Ngoc Lan, despite how she had kept her health related matters away from the public. However, as for her audio recordings during the years up until 1998, to me, she sounded fantastic, if not even better than ever before. Just take into consideration how marvelous she sounded on her audio recording of "Hanh Phuc Noi Nao" and compare that with her recordings from her early days for Da Lan and Asia Productions. I think you'll agree with me. I agree, since most of my favorite songs were actually recorded when NL was in her thirties like the albums Tinh Xua and Hanh Phuc Noi Nao or Cho Nhau Kiep Nao (ft. Ngoc Lan & Trinh Nam Son). Nhung su that minh lai thay Ngoc Lan va Vu Khanh khi song ca, mac du 2 nguoi dieu co chat giong that tot va hat rat la hay, khi song ca voi nhau khong hap cho may. Co le lo tai minh bi sao dau, nhung trong nhung bai hat chi Lan da hat chung voi anh V. Khanh, TP lai thay moi bai dieu co mot su thiu thon, thiu su truyen cam va nghe khong duoc em ai nhu la khi chi Lan hat song ca voi anh Quang. Cung nhu moi khi chi Lan hat song ca voi chi Kieu Nga, TP rat la thich. giong hat cua 2 chi nay rat la hap, qua de thuong. TP cam thay nhu la nhung bai hat chi Lan va chi Nga song ca giong nhu la minh dang nghe 2 nguoi ban than tri ky dang ke mot cau chuyen cung voi nhau cho moi nguoi khac nghe. I just love how both of their voices really complimented one another, especially with their cover of "Toi Jamais". Chi Lan cung da tung thau mot album duets cung voi chi Nhu Mai. TP rat ai mo giong hat cua chi Mai, nhung cung nhu truong hop khi chi Lan hat song ca voi anh Vu Khanh, minh lai khong may gi thich nhung bai song ca giua chi Lan va chi Mai, nghe coi ve 2 chi nay khi hat chung voi nhau lai khong duoc tu nhien nhu N.Lan & K.Nga..... Cac ban nghi sao? Ừ, chị Ngọc Lan hát với anh Duy Quang hay lắm chứ, chẳng hạn như các bài “Hoa học trò”, “Còn yêu em không”. Mình cũng thích “Ru em bằng tiếng sóng” chị Lan hát với anh Tuấn Ngọc. Phú thử cài phần mềm vietkey để gõ tiếng Việt có dấu xem sao.